Hotels.com within Wikitude might just be the ultimate travelers’ companion. Whether you’re hitting the road and “just winging it,” or find yourself in a situation where you’re not going to make it home for the evening, a quick scan of your surroundings with the Hotels.com world within Wikitude provides you with a comprehensive listing of all the accommodations around you. 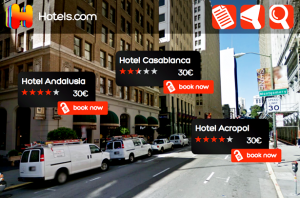 To assist you in finding your perfect hotel, the Hotels.com world within Wikitude provides not only an Augmented Reality view and location of all available hotels, but the graphic interface also clearly marks out the price you’ll pay for the evening, as well as a star based guest rating system. 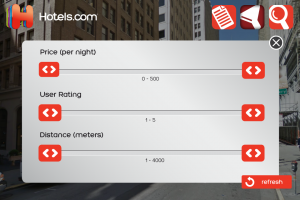 Once you’ve found a hotel that fits your criteria, clicking on the floating icon will bring up Hotel.com powered information including the hotels. For power users who want to compare and contrast, the Hotels.com world also offers a list view that lets you quickly scroll up and down a listing of hotels near you. A simple tap on the list icon in the top navigation menu will add an additional layer on top of your Augmented Reality view and present a list of hotels around you. This can be quite handy when you’ve narrowed your choices down to two or three hotels and don’t want to spin around and locate each individual hotel. Depending on your geographic location, you might find an overwhelming number of Hotels.com options around you. I.e. if you’re in the middle of Manhattan, there will be literally hundreds of hotels around you. In order to further customize your experience, we’ve built a filtering mechanism into the world. By clicking on the funnel icon in the top menu, you can quickly and easily filter by Price, User Rating, and Distance. If you have more specific requests to narrow down your search, the Hotel.com world also allows you to search by Check in/Check out dates, the number of rooms you need, as well as the number of adults and children that you’ll need rooms for. This filter may be found under the search magnifying glass at the far right of the top navigation menu. So whether you’re looking for a great last minute deal at a hotel near by, have family or friends that need a place to stay, or are setting out on your journey around the globe, Hotels.com and Wikitude combine the power of Augmented Reality and prices, user ratings and opinions, and “Book Now!” options in the palm of your hand, and ready at an instant!